Today we celebrate the feast of St. Lawrence, a deacon and third century martyr. St. Lawrence was one of the seven deacons of Rome who ministered to the people and acted as the Pope’s administrators. Lawrence died in the year 258, four days after four other deacons (their names were Januarius, Vincent, Magnus, and Stephen) and Pope Sixtus II were martyred as a result of celebrating the eucharist (Holy Mass). Their arrest occurred in the cemetery of Callistus. On the same day, by the order of the emperor Valerian, they were beheaded. There is little historical evidence remaining on St. Lawrence. His Acts had been lost by the time of St. Augustine in the 4th century. The tradition of the Church states that he was a native of northern Spain and was ordained by Pope St. Sixtus around the year 257. The Pope made him responsible for the distribution of the Church’s alms. Carl Brandon Strehlke mentions (in his contribution to Lawrence Kanter and Pia Palladino’s magnificent collection of essays and images on the life and works of Fra Angelico) that controvery with the story ensues at this point – the date of his martyrdom. Some accounts state that Lawrence was martyred under the emperor Decius (AD 249 – 251) and others insist that it was under the reign of Valerian (253 – 260). Regardless, the Church’s tradition states that Lawrence was martyred soon after the emperor Valerian issued an edict in early August of 257, requiring all bishops, priests, and deacons to be denied a trial and immediately be put to death. Valerian’s command was carried out. Lawrence is purported to have said, as the Pope and the deacons were being led to torture, “Where are you going, Holy Father, without your son? Where, O Bishop, without your archdeacon? Before you never approached the altar of sacrifice without your servant, and now you are going without me?” Pope St. Sixtus was said to have commented that he would soon follow them. You can understand that this story of faith and heroism had to be proclaimed and visualized. And close to 1200 years after the event, one of the finest painters in the Western tradition – Fra Angelico – was called to complete the task. The good Dominican friar was selected by Pope Nicholas V in 1447 to decorate a Vatican chapel dedicated to the two most famous archdeacons of the Church – the first century martyr St. Stephen of Jerusalem, and the 3rd century martyr – St. Lawrence of Rome. Fra Angelico successfully completed the task the Pope set for him. He linked the narratives of their stories together so that they convincingly expressed the main elements of each saint’s life. They are true catechesis as well as beautiful art. I have included one of my favorite images from Fra Angelico’s rendition – it portrays St. Lawrence in an exquisite rose colored dalmatic (the garment which signifies the deacon’s service and loyalty to his bishop – in this case the bishop is Pope Sixtus II). 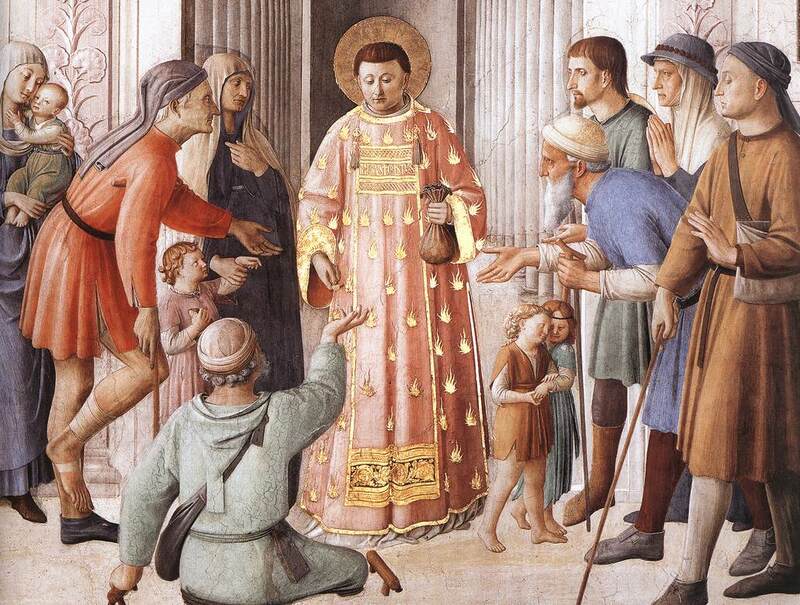 It shows him distributing the Church’s monies to those in need. It was painted (fresco) between 1447 – 1449 and is approximately 9 by 7 feet. Beautiful paintings. Beautiful post. I find myself more and more drawn to the stories of the saints. Who they are, what they did, and how they lived don’t seem to be taught or spoken of as much anymore. Thank you for reminding us all of St. Lawrence.